There are many things to consider when developing a sample prep method: Do I want minimal clean up or a more specific extraction technique? What interferences are specific to my matrix that I need to be concerned about? What type of sample pretreatment do I need to get the best results from my sample prep? I use a system called “plate mapping” to design my experiments. It allows me to systematically test different ranges or variables to optimize an extraction, scout a single variable or many at a time, and save time by generating data on multiple variables at once. Let’s look at a quick example: A basic in plasma. The drug has a molecular weight of 300 amu, and has an amine attached to aromatic ring. The logP is 4.5, and the pKa of the amine is 8.2. 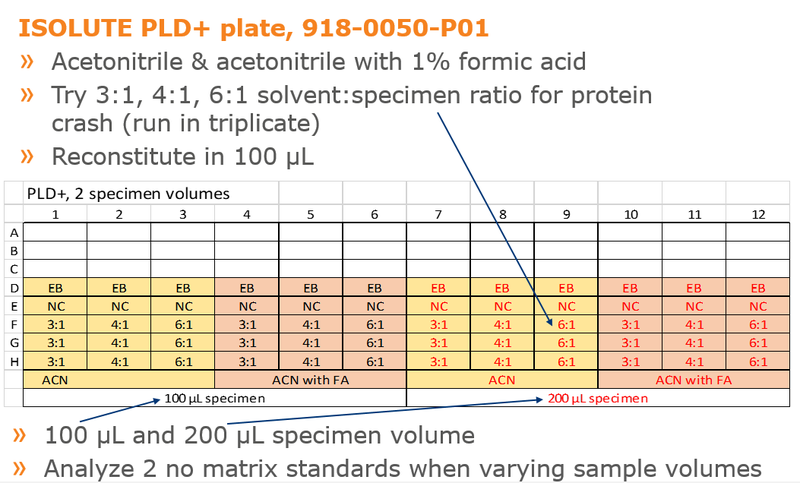 Desired LOQ is 2 ng/mL, and desired specimen volume is 100 – 200 µL of plasma, and I want to do minimal clean up. Samples are run in triplicate at 5-10 times the desired LOQ. In this experiment, we are evaluating 2 different specimen volumes (100 and 200 µL), three different solvent:specimen ratios (3:1, 4:1 and 6:1) and samples analyzed with and without formic acid. I also analyze an extraction blank, and a negative control (drug free plasma) for each set of conditions. I would also analyze a no matrix control (unextracted control) at the same concentration to assess process efficiency. The best option is determined by looking at average area counts and signal:noise for each set of conditions. Previous Previous post: How do I come up with a “starting point” for my SPE method?